Relations between the Egyptian government and the Muslim Brotherhood movement in Egypt, never less than tense, have recently taken a turn for the worse. 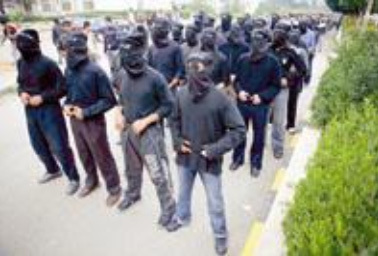 Following a December 10, 2006 march at Al-Azhar University in Cairo by masked, black-garbed students of the university who were Muslim Brotherhood members, the movement was accused of operating a "militia" that endangers state security and damages Egypt's image in the world. Following this event, the Egyptian authorities went on the offensive against the Muslim Brotherhood, moving against it in the security, economic, and media spheres. The tension between the government and the Muslim Brotherhood increased further following January 12, 2007 statements by Egyptian President Hosni Mubarak, reiterating that the Muslim Brotherhood was endangering Egypt's security, and following a declaration by Mubarak about the expected passing of a constitutional amendment banning religion-based political activity. The Muslim Brotherhood, for its part, stated that these moves by the government were a deliberate clampdown stemming from political motives, to prepare the ground for the accession of President Mubarak's son Gamal Mubarak to the Egyptian presidency. The Religious Establishment Resents the Muslim Brotherhood: "They Have Made Al-Azhar University Look... Like it is Exporting Terrorism"
 Al-Usbu' (Egypt), January 12, 2007. Al-Gumhouriyya (Egypt), December 27, 2006. The reform will include Article 5 of the constitution, which states that "the political regime in Egypt is based on party pluralism according to the basic principles of Egyptian society, as defined in the constitution, and set out in the Political Parties Law." Under the amendment, the following will be added: "There shall be no political or party activity or establishment of a party based on religion, race, or origin. The method of political and national work will be based solely on [the equality of all] citizens, regardless of religion, race, or origin." Al-Akhbar, Egypt, December 28, 2006. The secretary of the National Democratic Party clarified that even though the ban on religious parties was already law, the amendment was aimed at anchoring it in the constitution and consolidating it. Al-Ahram, Egypt, January 15, 2007. Al-Gumhouriyya (Egypt), January 25, 2007. Al-Wafd (Egypt), November 3, 2006.
 http://www.ikhwanonline.com, December 11, 2006. It should be noted that a few weeks before the students' association elections and the establishment of the Free Students Association, a similar attempt was made following elections in Egypt's labor unions. In that instance as well, the defeated Muslim Brotherhood representatives raised ideas for establishing parallel Muslim Brotherhood labor unions in protest against what they claimed was election fraud. Al-Sharq Al-Awsat, London, October 29, 2006. Al-Masri Al-Yawm (Egypt), December 11, 2006. Al-Sharq Al-Awsat (London), June 5, 2006. Al-Wafd (Egypt), December 17, 2006. Al-Masri Al-Yawm (Egypt), December 19, 2006. Al-Ahram (Egypt), December 20, 2006. Al-Ahram (Egypt), December 19, 2006. Al-Masryoon (Egypt), December 25, 2006. Al-Gumhouriyya (Egypt), December 18, 2006. Al-Gumhouriyya (Egypt), December 13, 2006. Al-Ahram (Egypt), November 11, 2006. Al-Wafd (Egypt), December 15, 2006; http://www.ikhwanonline.com, December 14, 2006, January 14, 2007; Al-Sharq Al-Awsat (London), December 25, 2006; Al-Ahram (Egypt), January 15, 2007. Al-Ahram (Egypt), January 13, 2007. Al-Masri Al-Yawm (Egypt), December 21, 2006. Al-Wafd (Egypt), December 15, 2006. Al-Masryoon (Egypt), December 18, 2006. Al-Gumhouriyya (Egypt), December 21, 2006. Al-Masri Al-Yawm (Egypt), January 13, 2007. Al-Masri Al-Yawm (Egypt), December 13, 2006.
 http://www.ikhwanonline.com , January 16, 2007. Al-Quds Al-Arabi (London), January 4, 2007. Al-Ahram (Egypt), January 14, 2007. Al-Masri Al-Yawm (Egypt), December 28, 2006.